This eye-cup magnifies the viewfinder image 1.18 times. When mounted on a K-7, the viewfinder magnification becomes 1.03x instead of the 0.92x without the magnifier. Fits the *ist D and all K series DSLRs. I have this permanently attached to my K-5. I had the KPS 1.35x before but I lost the rubber eyecup and you needed a screwdriver to attach it. 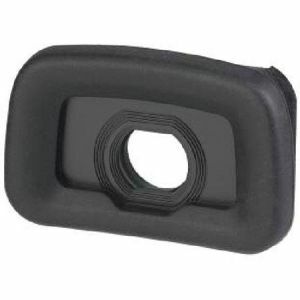 The O-ME53 just slide in place of the original rubber eyecup. Thus very easy to put in place or remove. Since it's thick it will give some nose relief. Pros: Just enough magnification to help with manual focusing. Together with the LL-60 focusing screen, it makes focusing my manual lenses as easy as it was with my film cameras. I dislike focus aids such as diagonal splits and microprisms because they screw up spot metering. Great support for easier manual focus, whether with or without focussing screen. May slip off accidentally e.g. when taking camera out of bag because it "sticks out" more than the standard eypiece. Makes what you see larger but inevitable a bit darker, too. Pros: Does its job seamlessly, great focus aid. I bought this for my K200 to aid me in macro focusing, as I wear glasses. Once I put it on I never took it off. it's followed me to my K 7 and continues to do it's job. I find it helps me focus for any pic I want to take. Wearing glasses anyway I don't find the difficulty in reading the info in the viewfinder that much different. When you wear glasses it can be hard to see from the odd angles used for macros anyway. In most normal shots I can see the info. The only nit I have is that it is a bit hard to clean. It will follow me through any body upgrades I will make. Cheap, well made, and useful. In this mini-review I will try to compare it to the KPS viewfinder. First of all... it works! It does make the image bigger, and noticable right when you take it off. Compared to the KPS, its magnification is inferior, but good enough if you're not using Manufal focus much (I find that to manual focus you really need all the magnification you can get). Third is vignetting. It has a little less than the KPS, but I'm not ready to give it higher points than the KPS for this, since the difference is quite negligible. If you can get one for $30, you should! It's a must have addition to a DSLR, manual focusing or not. If you don't like it, the marketplace always seem to have a high demand for it, so you won't lose out much even if you resell. This is an excellent little piece of accessory, to me it's a must-have. It not only provides the slight magnification of the already nice, large and brilliant viewfinders of Pentax dSLRs, it provides the photographer with some distance from the face to the camera back. This is great as for people with protruding noses it can be uncomfortable viewing through the standard eyepiece from having to press the nose into the camera back just to be able to get the eye closer to the viewfinder. So this eyepiece overcomes this issue quite well, and doesn't significantly diminish viewfinder brightness. I bought one of these to complement my split prism. While it did help, I got advice to try a KPS U13 1.3 X magnifier from a fellow forum member. I did, and sold the Pentax version, immediately--the KPS one is much better, though costs more than twice as much. This will help with manual focus, but the KPS eyepiece is even better. If you are using any manual lens then you should be looking at getting one of these, its a complete boon. Generally I can see everything, i.e. markings if I press in a little, do it out of habit now. Give more relief for your nose so less marks on the lcd. This is a worthwhile accy for people that manual focus or do macro. It offers magnification for the center without a compromise in coverage. It has the same form factor as the stock eyepiece cover and the diopter adjusts in the same way. I have 2 of these, one on a K20d and one a K200d. Pros: it really improve the clarity and make manual focusing easy. 1.18 does seem much, it has made a big diference for me. With the help of focusing beep/hexagon, MF is much better than the original viewfinder. as others mentioned, it keeps your nose off the the LCD. This gives a large and still bright view that aid in the focussing (I dont regularly use manual foucus lenses) and eases composition. It is comfortable and also helps keep my greasy nose from giving its smearing stains on the middle of the rear lcd. A nice accessory that helps me with manual focus. It protrudes a bit from the back of the camera, unlike the original Kx eye cup. This has turned out to be a good feature, as it keeps my cheek off the LCD! As I said on my Katzeye review, I manual focus with old eyes, all my bodies have these fitted. It just helps me to get better focus. They tend to slide off the camera if you catch them on clothes etc, keep a spare in your bag, they are not expensive. Just try one and see how you get on.